A dessert that requires no baking? It must be a Nanaimo Bar! 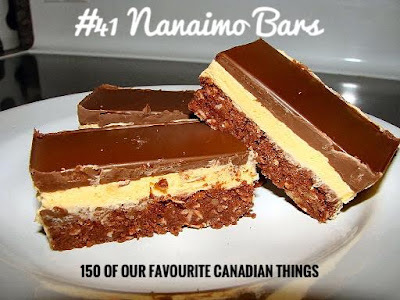 If you haven’t heard of or tried a Nanaimo Bar, you may not be a Canadian. The dessert itself is named after Nanaimo, British Columbia. It is a 3 layer treat that is simple and relatively quick to make. The bottommost layer is a chocolate, coconut and graham cracker mixture, the second layer is a vanilla custard and the top layer is chocolate. That’s it, a Nanaimo Bar! There is however a great debate happening on the desserts actual origin. New Brunswick claims they created the dessert but the first known recipe was published in 1954 in The Country Womans Favourite cookbook. Baltimore, Maryland in the United States also wants to claim the dessert as theirs because it was published in the His/Her Favourite Recipes cookbook in 1957. None of those claims can beat the original recipe of the Nanaimo Bar in Edith Adams Prize Cookbook (14th Edition) which was published in 1953. If you ask me the dates speak for themselves and the name does too. The city of Nanaimo is actually on the hunt for more publications of the recipe from the early 1950’s, so if you live in BC be sure to check in your grandparents or great grandparents cookbooks. If you should find the recipe in a cookbook from way back in the day, be sure to make yourself a batch of those delicious Nanaimo Bars before submitting it to their museum.